I’ll admit it, this picture, which is all over the net, is a cheap shot. Maybe there’s a picture of Bibi clowning around at a party somewhere, or one of a young Obama hitting the books. But nevertheless, it tells us something about the worlds that these two men grew up in. Barack Obama would have been 20 in 1981. The US was more or less at peace, and anyway there hadn’t been a military draft since 1972. The Iranian hostages were finally released in January, John Hinckley shot President Reagan in March, and Israel destroyed Iraq’s Osirak atomic reactor in June. AIDS, the IBM PC and Metallica all made their first appearances in 1981. Bibi’s 20th birthday came in October 1969. By this time he had already been serving in a special forces unit for two years, fighting the War of Attrition — a war that most Americans never heard of — that was Nasser’s way of emphasizing the Arab world’s rejection of any compromise with the Jewish state. In 1972 he was wounded in an operation to rescue passengers of a hijacked Sabena flight (his brother, Yonatan, was killed in a similar rescue mission in Entebbe in 1976). Bibi also fought in the Yom Kippur war in 1973. In the fashion of many Israelis, he deferred his university education until after military service. 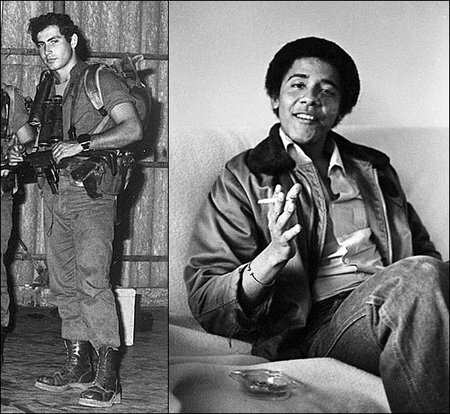 The young Netanyahu learned first hand about the hatred that the Arab world bore for Israel. And quite likely his military experience was also responsible for his oft-articulated belief that the only way to ensure the security of the Jewish people is for them to have the ability — both the weapons and the strategic position — to defend themselves. Barack Obama, on the other hand, went to Columbia University where he studied International Relations. Maybe he slept through the class on Arab intentions toward Israel, or, more likely, there wasn’t one. Little is known about his activities and associations, although he did take a literature course from Palestinian advocate and world-class fraud Edward Said, who — along with another activist, Rashid Khalidi, then running a Palestinian news agency in Beirut — would later become his friend. After graduation, Obama worked at several jobs, primarily as a ‘community organizer’, and later continued to Harvard Law School, where he “found his political voice.” Although he was very articulate, some credited his political success to his ability to hide his personal opinions, to be whatever his listeners wanted him to be. So we can’t go back to those indefensible lines, and we’re going to have to have a long-term military presence along the Jordan. I discussed this with the President and I think that we understand that Israel has certain security requirements that will have to come into place in any deal that we make. The Arab attack in 1948 on Israel resulted in two refugee problems — Palestinian refugee problem and Jewish refugees, roughly the same number, who were expelled from Arab lands. Now, tiny Israel absorbed the Jewish refugees, but the vast Arab world refused to absorb the Palestinian refugees. Now, 63 years later, the Palestinians come to us and they say to Israel, accept the grandchildren, really, and the great grandchildren of these refugees, thereby wiping out Israel’s future as a Jewish state. So it’s not going to happen. Everybody knows it’s not going to happen. And I think it’s time to tell the Palestinians forthrightly it’s not going to happen. The Palestinian refugee problem has to be resolved. It can be resolved, and it will be resolved if the Palestinians choose to do so in a Palestinian state. So that’s a real possibility. But it’s not going to be resolved within the Jewish state. It was suggested that Bibi had gone too far, even to the point of calling his polite but firm disagreement a ‘tantrum’. OK, now look at the picture. This entry was posted on Tuesday, May 24th, 2011 at 9:41 am and is filed under General. You can follow any responses to this entry through the RSS 2.0 feed. Both comments and pings are currently closed. The two pictures are a nice touch.They do say something. And this piece does point to key areas of difference upon which the Prime Minister stood firm. It was heartening to see the reception given the Prime Minister of Israel. I also strongly applaud the Prime Minister for his forthright and wise presentation. I had anticipated him falling into the trap of playing to one side only, and thus making Israel a partisan, campaign issue. He was wise not to do that, though it is clear that the Republican Party is without that kind of cold to Israel Left which the Democrats have. Bibi won this round, and that is all to the good. He was superb, overall. However, all be warned: Obama, may be a shallow, cowardly, snotty liberal left academia punk (and not just in the photo…I was born within two months of Obama and went to similar schools during similar time frames…I know his kind VERY well). But he is not stupid. And he is the most accomplished liar I’ve ever seen on the national stage, the consummate “con man”. I’m sure he has some other tricks up his sleeve. Bibi, Israel, and Israel’s supporters need to keep their powder dry and their eyes open. There will be more “rounds”, to be sure. Obama won’t forget this past week, and he’ll be looking to deliver “payback” some way, somehow. January 2013 can’t come soon enough.